ABBA became very popular after they won the Eurovision Song Contest in 1974. They had many hits. These included "Dancing Queen", "SOS", "Money, Money, Money", "Mamma Mia", and "Waterloo". Most of their songs were written by Ulvaeus and Andersson. They originally broke up in 1982, but their music is still popular. It has appeared in movies (including the Australian movies The Adventures of Priscilla, Queen of the Desert and Muriel's Wedding). The stage musical Mamma Mia! was developed from their music and subsequently made into a 2008 movie followed ten years later by a 2018 sequel Mamma Mia! Here We Go Again. ABBA recorded eight albums between 1973 and 1981, as well as some compilation albums. ↑ "ABBA Music News & Info". billboard.com. 2012. Retrieved 15 March 2012. ↑ "Björn & Benny (With Svenska Flicka)* / Björn & Benny* - People Need Love / Merry-Go-Round". Discogs. ↑ Meaning "Hey, old man". ↑ Songfacts. "Dancing Queen by ABBA - Songfacts". www.songfacts.com. ↑ "ABBA: 5 best song lyrics or verses". AXS. ↑ Inc, Nielsen Business Media (8 September 1979). "Billboard". Nielsen Business Media, Inc. – via Google Books. ↑ "ABBA IN JAPAN - ᗅᗺᗷᗅOFFICIAL.COM NEWS BLOG". ↑ "Why I loved singing about the pain of my divorce - by Abba's Agnetha". Mail Online. 5 May 2013. ↑ "The Visitors - ABBA - Songs, Reviews, Credits". AllMusic. ↑ Sheridan, Simon (2012). The Complete ABBA (40th Anniversary Edition. Titan Books (US, CA). p. 319. ISBN 978-1-78116-498-3. ↑ Palm, Carl Magnus (2014). Abba: Bright Lights Dark Shadows. Omnibus Press. p. 738. ISBN 978-1-78323-049-5. ↑ "ABBA Albums, Discography". billboard.com. 2012. Retrieved 15 March 2012. 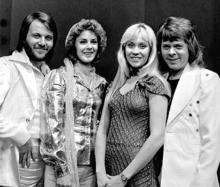 Wikimedia Commons has media related to ABBA. This page was last changed on 19 April 2019, at 13:08.